Katie and I attempted to go to a happy hour a couple fridays ago in the pearl, but with a new puppy, we didn't make it out of my apartment until after many happy hours had already ended. Instead we walked a block away and headed to Bastas on the corner of 21st and Flanders. They have a food happy hour in their bar all night and drinks on happy hour from 4 to 6:30. It was busy in the bar and the food looked great. 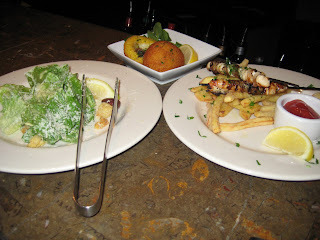 After pondering the menu we chose chicken skewers with yam fries ($4), a caesar salad ($3) and, upon the bartenders suggestion, we also ordered the Arancini ($4), a saffron rice fritter stuffed with ragout of zucchini and eggplant with fresh mozzarella. All were delicious, especially the Arancini. For drinks, I ordered a basil lemon drop ($8), which we would highly recommend. Katie ordered a pomegranate vodka martini ($8) which was also good, and strong! 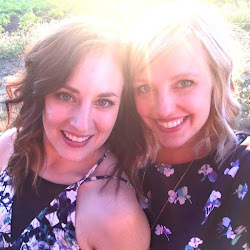 After sipping our drinks and eating our great food choices (so modest, we know), we decided this time that instead of another drink, we'd have another Arancini! This was a great choice, plus it saved us $12.